Welcome, CSBFS readers, to one of the most iconic mass-produced sportbikes in history. For many, the GPz series was the first introduction into sporty motorcycles – and Kawasaki capitalized on it with models across the displacement range: GPz305, GPz550, GPz750, GPz750 Turbo and GPz1100. Today’s bike is a very nicely restored 550 model, and 1981 was the first year the middleweight was added to the lineup. Powered by an inline four cylinder, air-cooled with DOHC two-valve heads (power was reported to be 55-59 bhp), the GPz550 followed the conventional Japanese tradition of evolution. 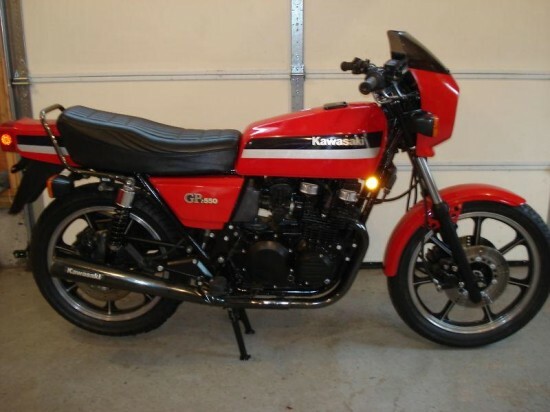 The engine and basic architecture was borrowed from the KZ series of bikes, themselves modeled after the mighty Z1. 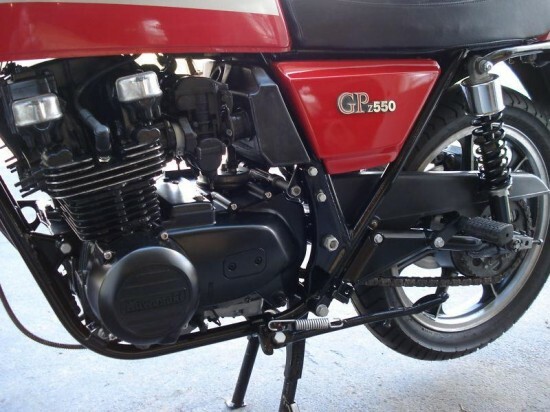 Fun Fact: The ’81 GPz550 was the only year that dual rear shocks were offered; by 1982 Kawasaki had adopted the Uni-Trac single-shock swingarm configuration for the entire GPz model range. Beautiful, stock GPz550 with only 10500 miles, a rare find in this condition. These ’81 GPz550’s are the first of the middleweight sportbikes, and as such, are becoming very collectible. This bike is all stock except for the seat cover, which is a replica of the OEM seat, it is made by Saddlemen. There are many new parts on this motorcycle including, New Bridgestone BT45 Tires, Battery, Fork Seals, Grips, Exhaust Gaskets, Intake Boots, In addition to this list of parts, the motorcycle has just had a thorough, professional repainting of the entire chassis, engine, and wheels. The paint on the bodywork is also in excellent condition. This a turn-key, running motorcycle. The carbs have been cleaned and synched, the mechanical advance has been cleaned and lubed, and the compression reads more than 150 psi across the board. It starts easily and pulls cleanly from idle to redline. The clutch and gearbox work smoothly, and there are no fuel or oil leaks. These motors are robust and long lived, and with 10,000 miles, this one has a lot of life left in it. It has only a few miles on it since being reassembled after the the restoration work was completed, and will remain that way until sold. I can email high resolution pictures, and I will happily answer all questions, except those about my reserve price. With the small bikini fairing, striking graphics on deep red paint, and glossy black chrome finish on the engine and exhaust, the GPz looked like it came straight out of Europe. It offered a jump in performance that was substantial at the time, and the GPz550 remained at the top of the sportbike realm throughout the first half of the decade. It is wonderful to see such care lavished over a survivor such as this; mass-produced Japanese sportbikes of this vintage are not exactly the blue-chip stock of the collector bike world. There were simply too many of them made to be special, and the price was never high enough to make them exclusive. What makes this one special, however, is the condition. Very low miles for the year as well as hard work on the part of the seller to revitalize older componentry makes this more desireable than most older bikes we see from this era.
. Be sure and let us know what you think! I wish I saw this bike before I started my own restoration project…it would have saved me a lot of money!!! 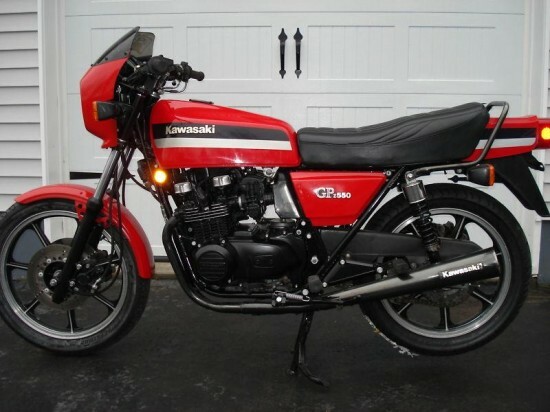 I have been looking for an ’81 GPz550 for long time and have never seen one this clean. +1 on that one, Ping. This GPz was pointed out by one of our sharp readers; this is sure one clean GPz. I doubt you can restore a bike for the kind of money being asked for this one.